People love dahlias because of their beautiful large blossoms that come in a variety of colors and sizes. Beginning gardeners love them because they are quite easy to grow. However, dahlias are a cool-climate plant and are not traditionally grown in tropical climates. But if properly cared for and kept cool during the hot summers, certain varieties of dahlias can survive tropical temperatures. Ideal varieties of dahlia for tropical climates are heat-tolerant ones like Kidd’s Climax, Juanita and Prince Noir. Select the right location to plant your dahlias. Even in hot, tropical climates, dahlias need full sun to thrive but can benefit from light afternoon shade. However, dahlias do need protection from direct wind. They do not put down deep roots and are easily blown over. Prepare the planting area in the fall. Dahlias can grow in a variety of soil types. But to survive in hot tropical climates, they need a solid foundation of slightly acidic, well-drained fertile soil. Use a hand tiller or rototiller to till the soil to a depth of 10 inches. Then amend the soil in your garden by adding 1 inch each of aged compost, peat moss, sand, and rotted manure. Then spread 3 lbs. of organic balanced fertilizer (8-8-8 or 10-10-10) per 100 square feet over the area. Mix these amendments in by tilling the ground again to a depth of 1 foot to create a slightly raised planting bed. Hand-weed the planting area to keep it free of weeds during the winter. Loosen the soil again in late winter/early spring just before you plant your dahlias by tilling it to a depth of 10 inches. In tropical areas, dahlias should be planted as early as possible to allow them to establish themselves before the hot summer months begin. Dig holes for your dahlia bulbs. 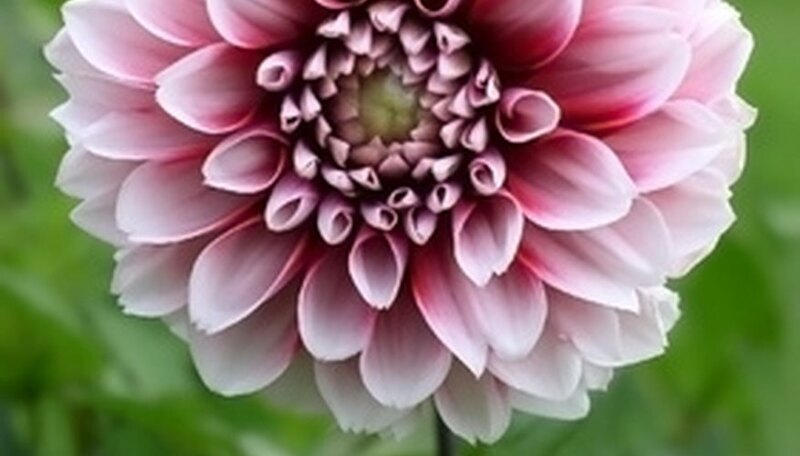 Each hole should be a little wider than the dahlia bulb and between 5 and 6 inches deep. Neighboring dahlias, in tropical climates, should be at least 2 feet apart. Overcrowding dahlias in hot and humid areas can encourage the growth of powdery mildew. Rows should be 4 to 5 feet apart. Stake the holes. Dahlias often grow over 1 foot in height and need to be staked. Pound a 4-foot stake into the ground next to each hole. When the dahlias grow to 1 foot tall, begin tying them to the stake. Tie them again for every 18 inches of growth. Plant the dahlias in their holes. Unless the weather is very dry, do not water your dahlia bulbs at this time. They may rot. Once the dahlias germinate, begin watering when the top few inches of the soil are dry. Water the dahlias deeply at each watering so that the soil is moist. But take care not to wet the foliage or your dahlias may develop powdery mildew. However, on hot summer days, dahlias can benefit from a light, daily misting. Spread a 2-inch layer of organic mulch over the planting area once the dahlias germinate. In tropical climates, this is essential. It will keep the dahlias cool in the summer. Hand-weed the area as necessary. Prune the dahlias occasionally. Remove any broken or damaged foliage. Once your dahlias have reached a foot or so tall, remove the lower leaves to improve air circulation in the plant and discourage powdery mildew. Cut your dahlias back to 4 inches in height when the foliage dies in winter. Then spread a 5-inch layer of mulch over the planting area for the duration of the winter. The dahlias will come back next spring. Dahlias grown in tropical areas are prone to slug infestations. Spread slug pellets over the planting area to deter these pests.